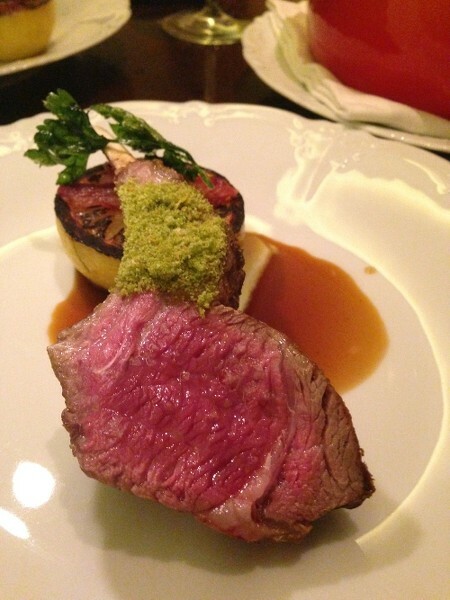 Chef Markus Glocker’s huge lamb chop with gremolata crumbs is brilliantly rare. Photo by Zarela. My friend Zarela and I are rooting for Drew Nieporent to triumph at Bâtard. He deserves a win after the devastating and nasty blowup with chef Paul Liebrandt that led to the closing of Corton in the space that began as Montrachet in 1985. Drew has never let anyone forget how chef David Bouley walked out to open his own place a few blocks away, months after earning three stars for Montrachet. And now Liebrandt had abdicated to Brooklyn. Nieporent and I have been fencing as restaurateur and critic since his days as a captain at Maxwell’s Plum. Rooting for him now is not a proper stance for me as a professional fourchette. Remember, at least I confessed. I wonder if battered Drew Nieporent knew what he was getting into with the perfectionist Chef Glocker. I didn’t rush to Bâtard when Drew called to say the door was about to open and that it would be “more user-friendly than Corton.” To be frank, I’d never heard of his new chef-partner, Austrian-born Markus Glocker, with his Michelin-star-pocked resumé. How parochial of me. 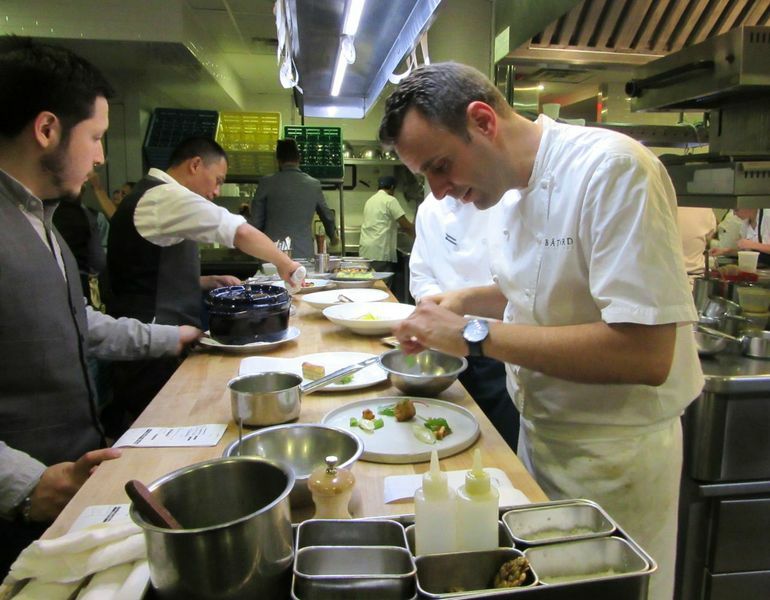 It seems that the chef and longtime Daniel maître d’ John Winterman had been planning a restaurant of their own when they made a bid to team up with Nieporent. I found the room a bit dreary and sad. Filled with savvy eaters, it can be cheerier but painfully noisy. Quite frankly, the first buzz was not encouraging. It’s early tonight on a summer Saturday. The room is sparsely populated. I find the spartan design -- the subdued walls, sprays of flowerless branches, orchids in far corners too small to register -- all a bit sad. Zarela doesn’t seem to mind, though on that first evening, servers making pronouncements over our conversation are annoying. I’m wondering if in the rush to open on schedule, no one took the time to train them. I’d never seen anything like the poppy-seeded twist on my bread plate -- I like that -- but it tastes stale. Think there was nothing new to do with octopus? Try this bold terrine with ham hock. Photo by Zarela. 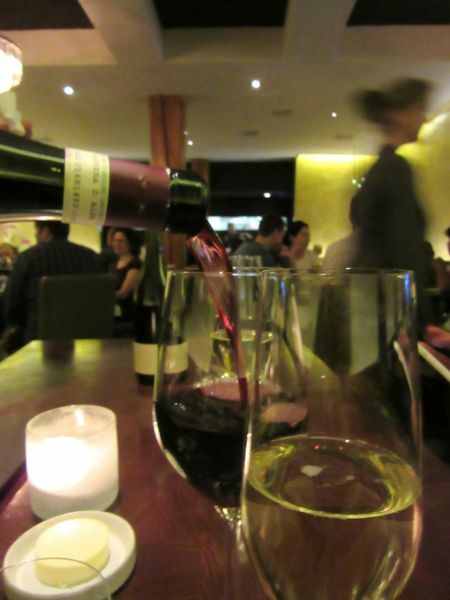 Still, Zarela and I are sipping generous pours of red wine by-the-glass from seriously beautiful goblets. 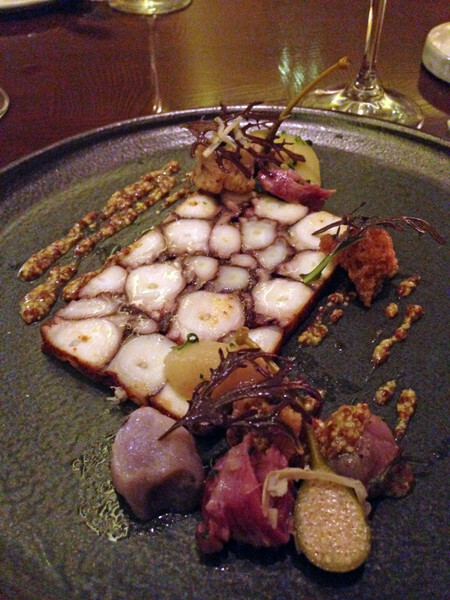 We are exclaiming with surprise and pleasure over the stunning still life of octopus “pastrami” terrine. The creature is impeccably tender, full of flavor, alternating with chunks of braised ham hock and potato, framed by rivulets of Pommery mustard. Crisp fried buttons of pig’s tail and minced pickle play against the brine of plump Stellar Bay oysters. Plump and briny Stellar Bay oysters, paired with crisp buttons of battered pig’s tail and bits of pickle, are a sensuous notion. Ours is a gift from the house, but anyone can order it from the menu, two courses for $55, three courses for $65, four courses for $75. Fluke, sweet shallot and salsify crumble lurk in this chilled pea soup with salsify crisps. 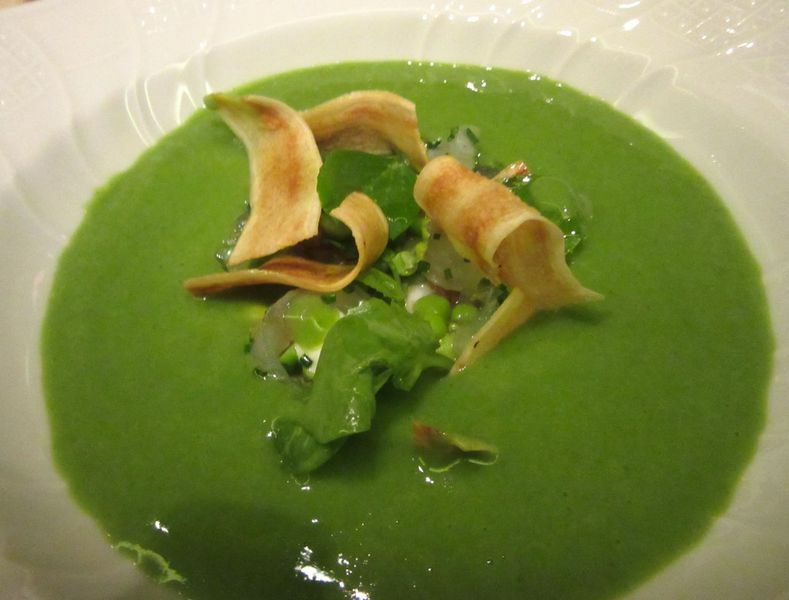 Chilled pea soup with slivers of fluke, braised shallot and salsify crumble, and floating salsify crisps is good, too. The green satin goo gets poured at table a la minute, in the modish gesture of luxury. 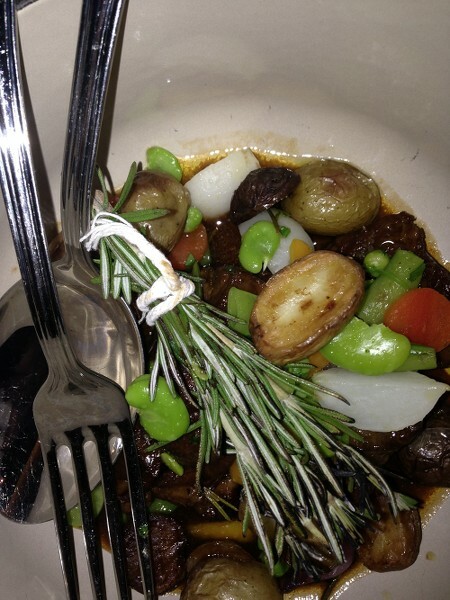 Zarela (her photo) and I are dazzled by the sensuousness of lamb shoulder confit with veggies. But it’s the lamb feast for two that has us hyperventilating. To think I almost didn’t order it because of the $15 supplement. For each of us, a mammoth chop, exquisitely rare, with a tutu of powdery green gremolata. And between us, the braised confit of shoulder with potatoes, carrot rounds and favas stays warm in an orange Creuset pot. This is not your Betty Crocker lamb stew. 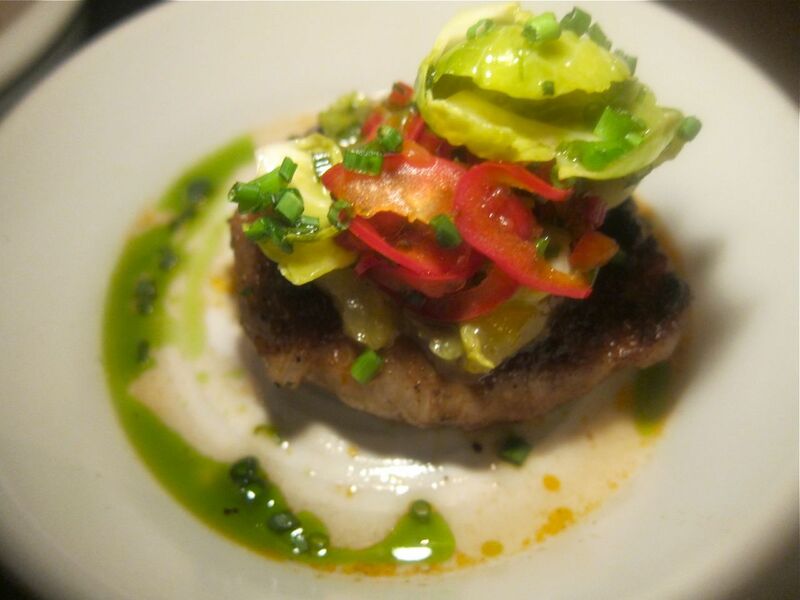 It’s a chef-sorcerer’s invention with flavor tricks even we cannot imagine. More than we can finish. The chop nuzzles a broiled lemon half -- I press my fork into the lemon and brush a cut of lamb against the tart nectar. The combination makes me shiver. Époisse, the luscious, soft and pungent Burgundian cheese, is listed among the dessert choices. Amazingly, or maybe not so amazingly, we find the appetite to scoop up a cunning chef’s delivery of Époisse -- a soft and powerful Burgundian cheese both of us adore and rarely see. There are mushrooms, vinegar, cipollini, apricot, grilled thins of baguette to pile it on. 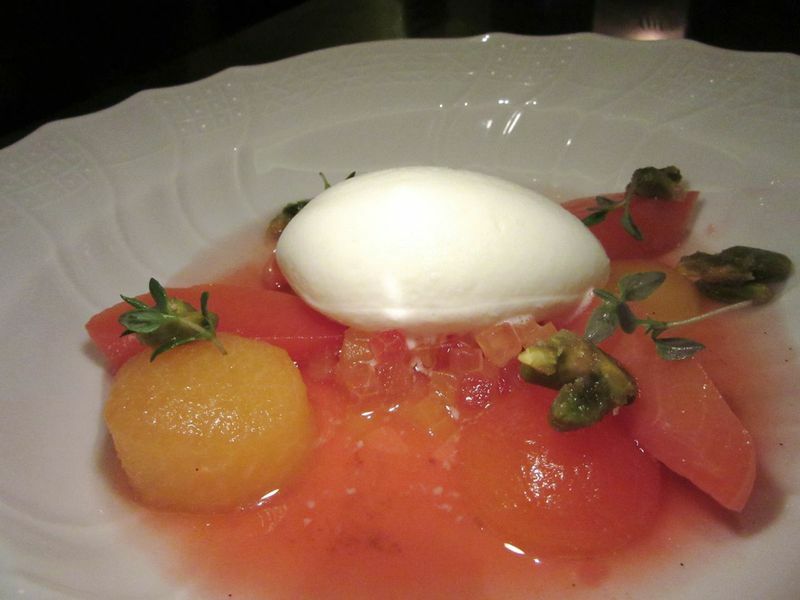 Rounds and slices of poached stone fruit with an oval of lemon thyme ice cream follows. Poached stone fruits with candied pistachios is exactly what I want to finish on a summer night. 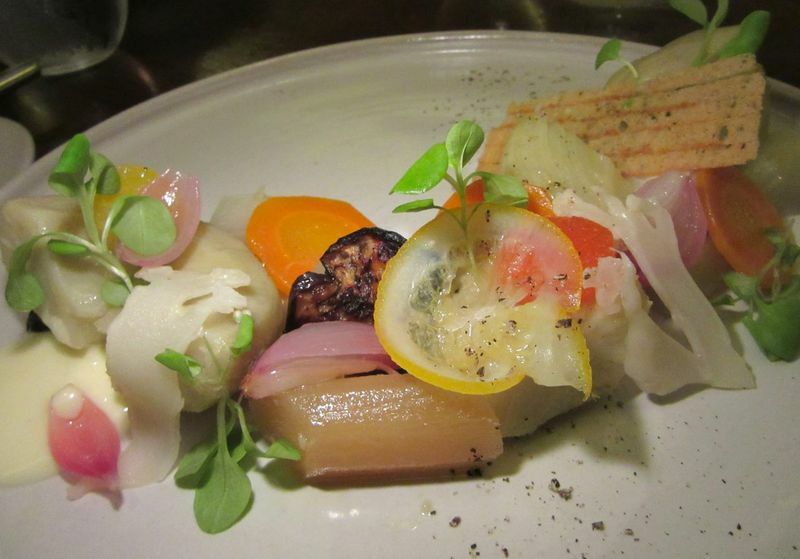 Nieporent has been spinning a promise of unfussy food at a relatively gentle price. But his chef is a fusser. 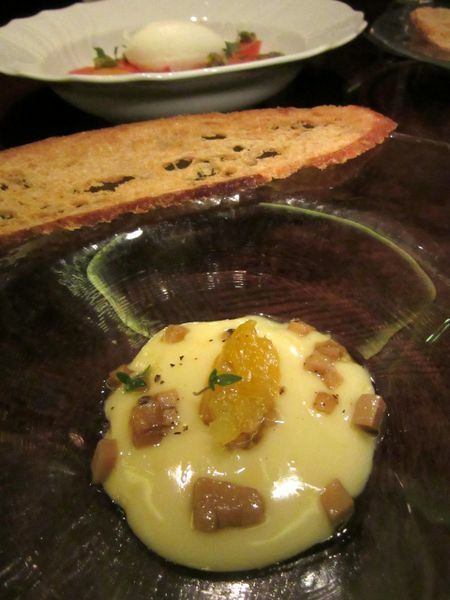 And our three courses with two glasses of wine is more than $100 per person, tip included. Not that we mind. “The only thing missing is cookies,” I say. A minute later, two big marzipan cookies arrive. Zarela take a tiny bite. I cannot resist marzipan and finish hers too. 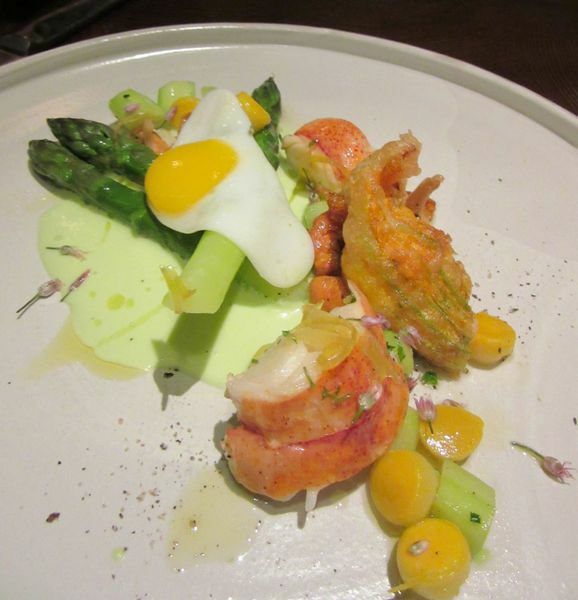 The chef stuffs a squash blossom with prawn mousse on a fussy lobster plate. I want other friends to taste that lamb. I need to explore more of the menu. I’m back a few days later. It’s Thursday and the house is crowded. Drew paces back and forth making sure Winterman knows who’s who and how to indulge returning regulars. It is painfully noisy. Nieporent has consulted David Rockwell -- the architect of Nobu spied walking by with his dog -- about sound-proofing. I want to try the rabbit in “flavors of bouillabaisse” but these friends are not rabbit-eaters. And everyone at our table is avoiding carbs, so we will not be tasting the black olive tortellini or the Parmesan risotto. Who will order the lamb for two? There is considerable debate until our waitress announces that chicken schnitzel is a special. Lamb and carbs are forgotten. Everyone wants schnitzel. But aren’t we all sharing? I try to cajole. Marinated artichoke poached barigoule-style comes with mayonnaise made from the poaching liquid. By now, surely Drew has discovered that Glocker is no less demanding in the kitchen than Liebrandt. He arrives at 8:30 am to check the deliveries. At the moment, he has an entire cast of cooks working from 10 am to 1 am while they learn the routine. At some point, he will set up two shifts. (Presumably with the survivors.) Of course all the bread is baked in house -- the braided poppy seed roll is from his childhood. With the seeds scraped away, it provides crumbs for the schnitzel. “It’s not often we get monkfish cheeks,” the chef says, adding maitakes and house made noodles. The noodles with tonight’s special monkfish cheeks are made by hand that day with a touch of saffron and fennel pollen, and that crunch exploding on top is a complicated fennel crisp. What sounds like a simple lobster starter has prawn-stuffed deep-fried zucchini flowers. The marinated artichoke barigoule is spiked with Kalamata olive and dressed with a tuile. 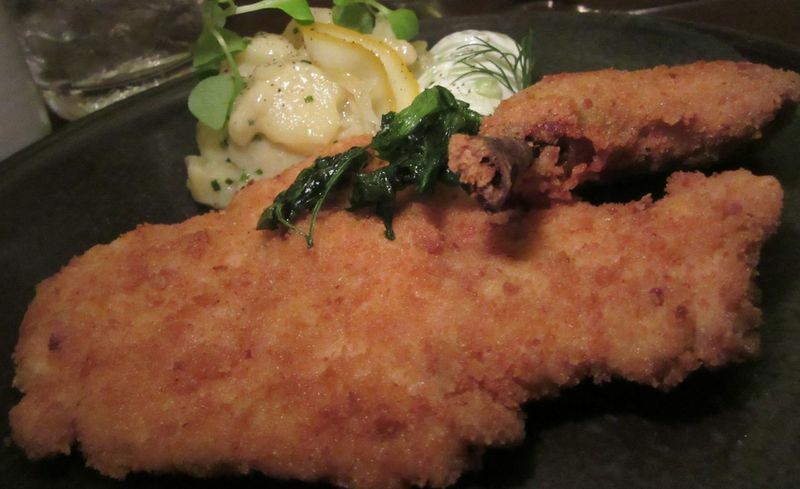 Crisp chicken schnitzel with small-batch potato salad and cucumber ribbons is a big hit at our table. The remarkable potato salad nuzzling the schnitzel is made in small batches -- potatoes cooked in lovage-infused veal stock -- and must never be refrigerated. 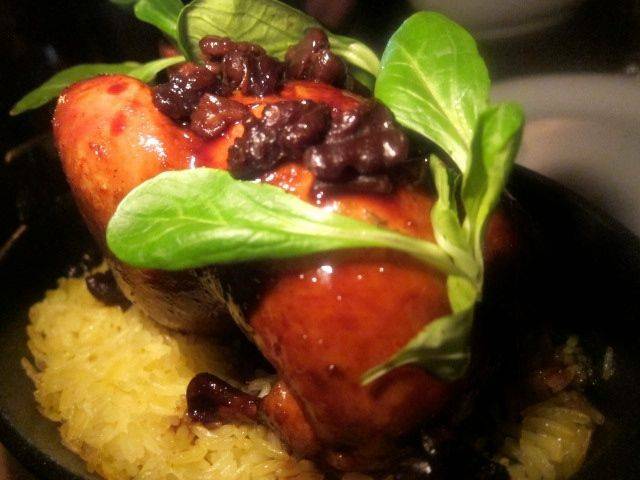 It’s not a chicken schnitzel -- it’s a poussin schnitzel. Those are not just lingonberries in the creamer alongside, they are mixed with sea buckthorn berries for a citric blast. You never heard of sea buckthorn berries. That’s okay. Glocker has. Yolks from rare New Hampshire chickens are stuffed inside the turbot to burst over the spinach below. 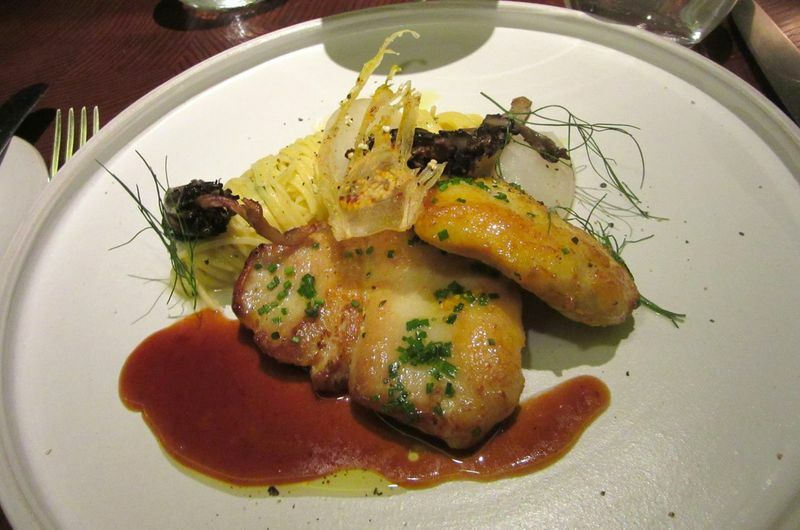 And then there is the turbot. 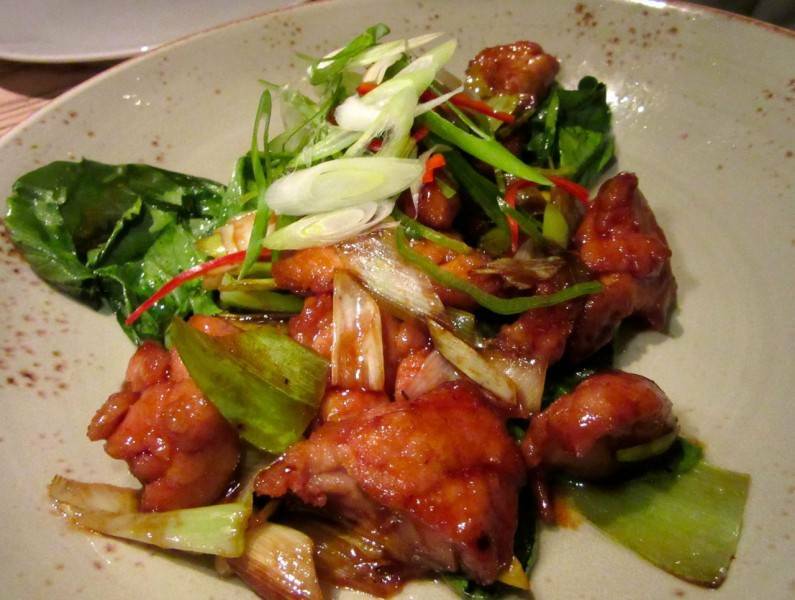 All of us sharing tastes are stunned by its freshness, its superlative texture. It’s an astonishment in the mouth. Its bright green puddle of parsley coulis could not be more green. Little nests of salted pumpkin seeds add nuttiness and textural crunch. 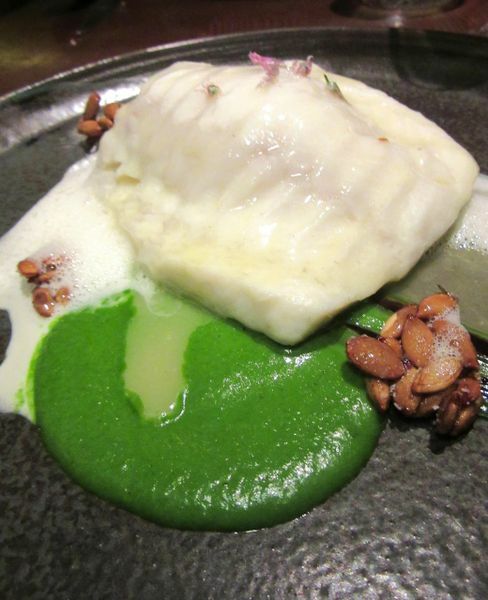 What we cannot even guess is that patrician egg yolks from a New Hampshire fussbudget farmer have been inserted into the turbot so that they explode into the spinach below. Ask and the chef will tell you, but if the waiter had alerted us, it might have been too precious, he says. A crumbly buckwheat crust does nothing much to enhance the key lime pie for me. The Viennese perfectionist is doing his own desserts too. 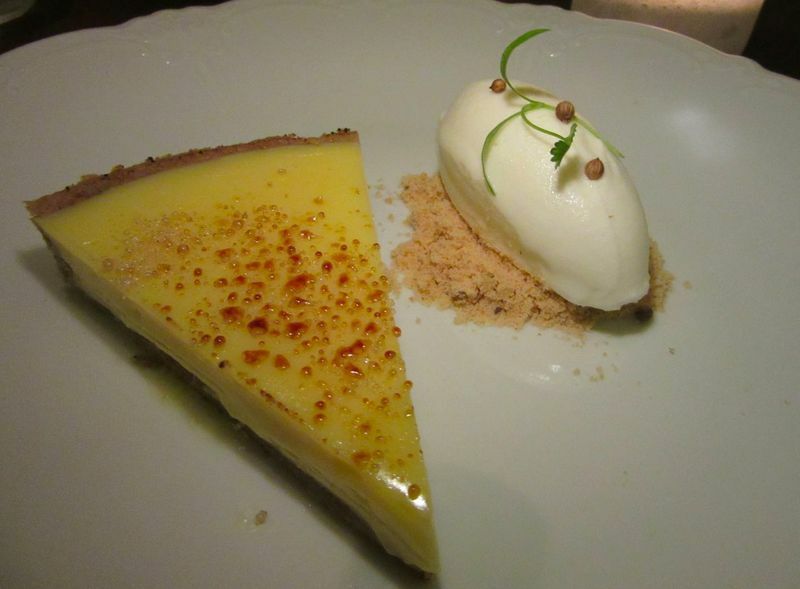 The key lime pie comes on a buckwheat crust. His sachertorte has the classic Sacher stamp on top. 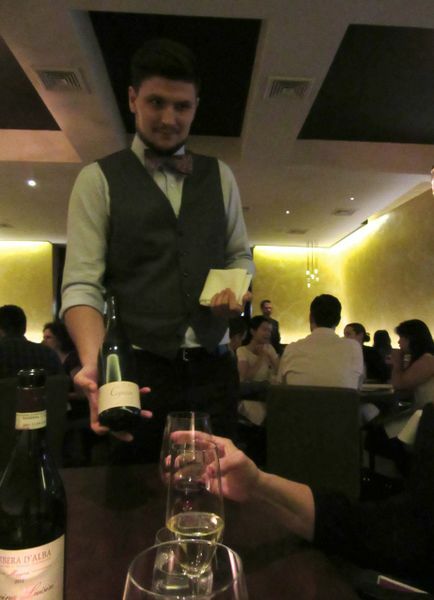 The waiter pours a taste for approval. Zarela is amused her wine is Copain, French for pal. Revenge is a dish best eaten cold, the saying goes. And if eating well is what counts here, it looks like Bâtard could prove a fine revenge for Nieporent. All he has to do is survive the ambition of this chef. And yes, sound-proofing soon will help and maybe some big bursts of flowers when the budget permits. The service is properly attentive tonight. New Yorkers who live to eat will want to know what’s happening at Drew’s place. And they won’t be drinking $9 Côtes du Rhône by-the-glass. Surely there are magnums of Burgundy worthy of this food stashed close by. 239 West Broadway between White and Walker Streets. 212 219 2777 Tuesday through Saturday 5:30 to 10:30 pm. Click here to see my fabulous vintage evening bags on summer sale now, $30% off for any bag $100 or more.